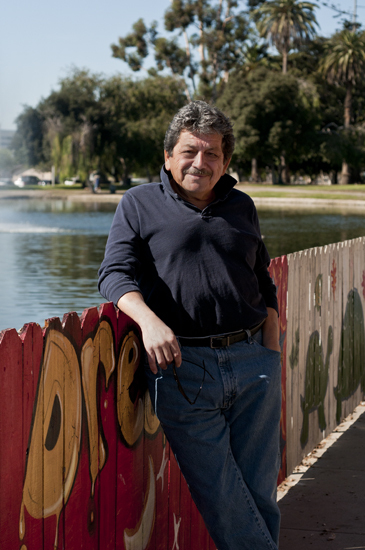 Tomas Benitez has spent his life in the arts community of East Los Angeles -- as a writer, Shakespearean actor, consultant to the Smithsonian, UCLA, and USC, and countless other organizations, as a commissioner for the County of LA Arts Commission, as executive director of Self Help Graphics, as a grant-writer, and currently as Development Director of Plaza de la Raza in Lincoln Park -- where we interviewed him in his office, a mini-gallery with pieces by Patssi Valdez, Frank Romero, and others. His personal collection of posters, gallery invitations, and other ephemera is held by the Chicano Studies Center at UCLA. 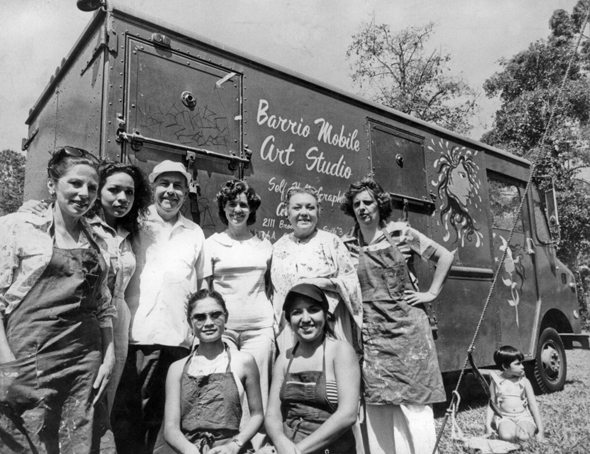 We talked to him about the legendary Sister Karen Boccalero and the early days of SHG, the leading visual arts organization serving East Los Angeles and producer of the largest collection of Chicano prints in history. Self Help Graphics was the first group in LA to produce Dia de los Muertos (Day of the Dead) celebrations in the early 1970s. Where were Sister Karen's beginnings? Sister Karen Boccalero was a Franciscan nun. She was raised in East LA, at the top of Gage and was living there when she passed in 1997. When I was raised in East L.A., Armenian, Russian, Jewish, Mexicans from here and there, Asians, Russians, and a smattering of other Latinos, all lived in a multicultural dream that people only later could identify. Jews came in the 1930's and were excluded from living in most of L.A. They concentrated there, and Boyle Heights was the Ellis Island of west coast. Tell us about sister Karen's inspiration. Sister Karen had a religious catharsis when she dedicated herself as a bride of Christ, but she was also a progressive, chain-smoking, cussing nun. She was a visual artist, a print-maker who had studied in Rome and with Sister Corita Kent. Sister Karen was an intellectual giant and gave language to contemporary culture. What was her religious background? Franciscans are very nurtured. They often wear secular clothing like pants because they work in the community, giving service, like Saint Francis of Assisi. They are progressive humanists, and believe all things living are precious. The printmaker Sister Corita Kent came from this tradition as well. Tell us about the early days of SHG? SHG started with an old printing press in the garage behind the house where Sister Karen was living with some sister nuns in the old neighborhood. During the late 60's and early 70's, when Chicanos began expressing themselves (Chicano Moratorium against the Viet Nam war; opening of Chicano Studies centers at universities; killing of Ruben Salazar) Sister Karen was making prints. Prints are an egalitarian way to make art because they are multiples - you create a stack of paper and disseminate. She had an egalitarian way of thinking. Her decision to create a workshop and organization open to the public changed the artist paradigm and made art become service-oriented, which was fine with her. Some artists wanted to keep SHG elitist, like the Mexican, western Euro-centric model - the atelier, the membership elite. Karen said no, look at what's going on with street theater, the murals, protests in the streets - we need a way for artists to come in and express themselves. Early in the 1970s, she understood that the non-profit model was responsive to the community. Asco theater group had done a Day of the Dead play and brought it to Self Help. She was working with Tom, a Franciscan brother, who was a serious supporter. He was 300 pounds and had hands the size of hams. He was willing to go into a cemetery and perform a service for the Day of the Dead, and at the last minute he received a direct order from the diocese that if he performed the Day of the Dead service, they would defrock him. Sister Karen said 'no, we need you.' So he taught one of the artists the role and gave him the masks and costumes. This was a performance art piece with Brother Tom's heavy cassock... theater in the round. Tell us more about your friendship with Sister Karen. A muralist from Chicago comes in one day and he's a good looking dark bearded guy, Karen flirts with him, and I say, 'You are acting like a hot 14 year old girl,' and she said, 'That's exactly how I feel.' We both smoked too much and we were up too late one night. Now, I am a confirmed pagan with an acrimonious relationship with church, I was bounced out of Assumption and altar service - and we were talking and she has a holy message in her heart. Around 2 am we're out of cigarettes and coffee and she says, you know Benitez, you just need your own f---ing religion. I fought her to a draw. She really made a choice to stop creating her own art in favor of creating the art center. While I was director at Self Help I would spend the day making prints to know what it was like to create art - make sure there was toilet paper and food, to make sure it was comfortable and everything was clean. That's part of being an executive director you have to know peoples' jobs. She became ill and my wife, who is a nurse, and I took her to the hospital. My son said, 'Bye Karen, I love you.' She died in my arms that night. She was only 63.
Who in your life has influenced you? My mother - I'm 100% mama's boy, she was the smartest and strongest woman I ever met, while Sister Karen was the most spiritual. My mother was dedicated to community activism. She was a single mom most of her life even though she had a relationship with dad. My job was to tell her a story every day. She'd be riding the bus with her shoes off, and she'd say, "You are a storyteller." She was an activist here at Plaza la Raza, saving the boathouse. Why do you believe creativity is important? Creativity is natural... it is repressed under current pedagogy in America but it is natural to humans. Creativity has to be nurtured. 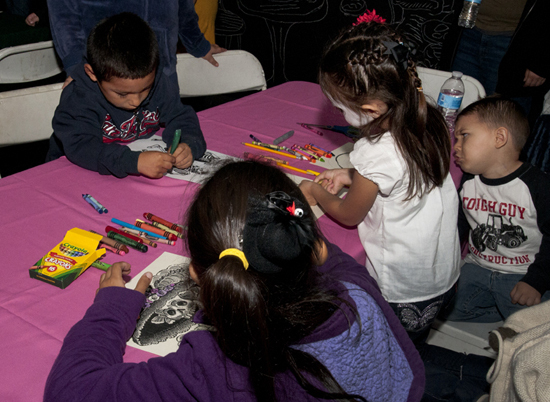 In indigenous cultures there is no word for art - everybody does something creative every day. We have not incorporated this wisdom into our aesthetic. A pot is useful, and that makes it more beautiful not less. When we study Aztec culture, what we are looking at are some broken pots, and distilling ideas about their culture from artifacts. Art and culture should be part of education, sociability, spirituality, daily family life. Practicing art is natural and empowering and makes us better human beings. What do you see as your contribution? I'm constantly writing; that's one of the blessings I have. I have a profile in the arts community and I have learned the best thing my generation does is get out of the way and let the young go forward. We stand on each other's shoulders.. Whatever I can do, whatever I did, was always geared towards not only exposing people to more art, but trying to figure out a way to bring up a generation that would continue that tradition.